Although fire has had a hand in shaping forests across the entire Intermountain West, we have limited our discussion to the roughly 34 million acres of forested land in the northern Rocky Mountain region of the U.S. Our focal area is western Montana (west of an imaginary line running from Red Lodge to East Glacier National Park) and northern Idaho (north of the Salmon River - see map below), an area consisting largely of mountains and intervening valleys (Nesser et al. 1997). Mountains within this area often rise to elevations of 7,000-10,000 feet and support extensive forests to timberline. Valley base elevations range from 2,000 feet in northwestern Montana and northern Idaho to 6,500 feet in southwestern Montana. The intermountain valleys in northwestern Montana and northern Idaho are often forested; those elsewhere within the focal area tend to support grassland, shrub-steppe, bottomland-hardwood, or cultivated vegetation (Arno 1979). Forested lands in the northern Rockies are commonly distinguished by the types of trees they support, with differences in dominant tree species among sites generally reflecting geographic differences in temperature and moisture available for plant growth (Pfister et al. 1977, Arno 1979, Cooper et al. 1991). Due to the influence of moist maritime air flowing in from the Pacific Coast to the Continental Divide, the climate of northern Idaho and northwestern Montana is generally mild for this region, milder than that of southwestern Montana (Arno 1979). At a local scale, moisture levels tend to be high at middle elevations, on north-facing slopes, and in sheltered valleys (Barnes et al. 1998). In contrast, low, south-facing sites and high-elevation, windy ridges are relatively dry. Lands at high elevations and shaded, north-facing slopes at lower elevations are generally cold, whereas sites at low elevations and on south-facing slopes are much warmer. Different tree species tend to thrive under different environmental conditions. For example, ponderosa pine thrives on sites that are relatively hot and dry during summer months (Foiles and Curtis 1973). In contrast, trees like western red cedar and western hemlock prosper in relatively mild and moist environments, like those found within the maritime-influenced climatic zones of northern Idaho and northwestern Montana (Pfister et al. 1977, Arno 1979, Cooper et al. 1991). Lodgepole pine and subalpine fir are two tree species that grow relatively well in very cold locations within the region (Pfister et al. 1977, Cooper et al. 1991). Such environmental affinities explain, in large part, the pattern of tree species distribution and forest development in the northern Rockies. They also help explain why forests dominated by different types of trees tend to differ in their general fire histories. For example, the warm, dry environments in which ponderosa pine thrive also happen to be extremely fire-prone, while the cold, moist environments that favor growth of the subalpine fir may seldom carry fire (Fischer and Bradley 1987, Smith and Fischer 1997). 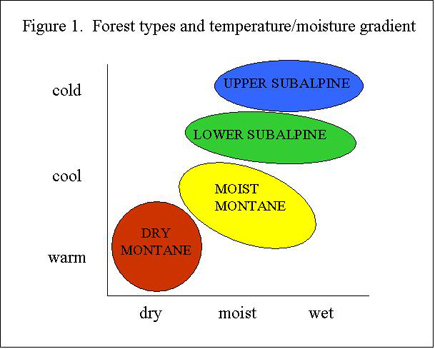 Each of these forest types experiences a unique moisture/temperature regime, roughly corresponding to (1) warm, dry; (2) warm, moist, (3) cool, moist; and (4) cold, moist environmental conditions (Figure 1). 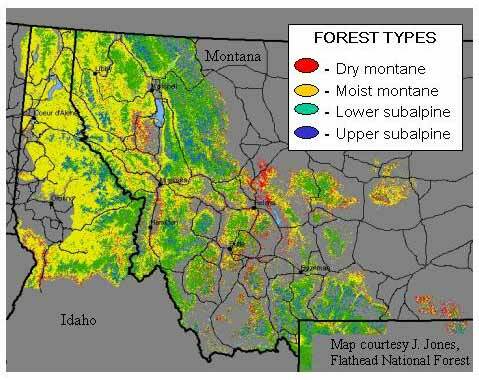 The map below shows the distribution of these forest types in western Montana and northern Idaho. Click on a forest type from the list above to learn more about each. Arno, S. F. 1979. Forest regions of Montana. USDA Forest Service, Intermountain Forest and Range Experiment Station, Research Paper, INT-218. Barnes, B. V, D. R. Zak, S. R. Denton, and S. H. Spurr. 1998. Forest Ecology, 4th ed. John Wiley and Sons, New York, New York, USA. Fischer, W. C., and A. F. Bradley. 1987. Fire ecology of western Montana forest habitat types. USDA Forest Service, Intermountain Forest and Range Experiment Station, Research Paper, INT-223. Foiles, M. W., and J. D. Curtis. 1973. Regeneration of ponderosa pine in the northern Rocky Mountains. USDA Forest Service, Intermountain Forest and Range Experiment Station, Research Paper, INT-145. Nesser, J. A., G. L. Ford, C. L. Maynard, and D. S. Page-Dumroese. 1997. Ecological units of the Northern Region: subsections. USDA Forest Service, Intermountain Research Station, General Technical Report, INT-GTR-369. Smith, J. K., and W. C. Fischer. 1997. Fire ecology of the forest habitat types of northern Idaho. USDA Forest Service, Intermountain Forest and Range Experiment Station, General Technical Report, INT-GTR-363. Arno, S. F. 1980. Forest fire history in the Northern Rockies. Journal of Forestry 78:460-465. Peet, R. K. 1988. Forests of the Rocky Mountains. Pp. 63-102 in M.G. Barbour and W.D. Billings, eds., North American Terrestrial Vegetation. Cambridge University Press, New York, New York, USA.